You know its funny that when I read books on adventure and watched movies about people traveling around the world they always included someone getting sick. I never thought about it nor did I think that I could get sick but I was wrong twice. I guess after getting out of the Jungle and then sailing for 3 days I was hit by a bug pretty hard or something. I thought that it may be the onset of malaria but I am just about 100% normal haha. I hope that I continue to feel better and I am looking forward to our transit through the Panama Canal in April. I just wish that it was not so hot here, its 90 degrees with very high humidity and no wind. At night it gets down in the mid 80’s but the mosquito’s come out and you have to stay in the cabin where its hotter. I just can’t win the heat battle here. The marina we are in is full of cruisers making their way through the canal and working hard on thier sailboats for the next leg of their trip. My dad has been busy scrubbing and working on the boat the last few days as I have been laying around sick however I rather be scrubbing. We have also been working hard with all the paper work and red tap it takes to get through the canal. The rules here in Panama are very difficult and there are a lot of things set up in ways to make you pay more money than you should have too. But the great thing about traveling is the struggle of the journey. One day I may make it all the way home and look back at this and laugh. 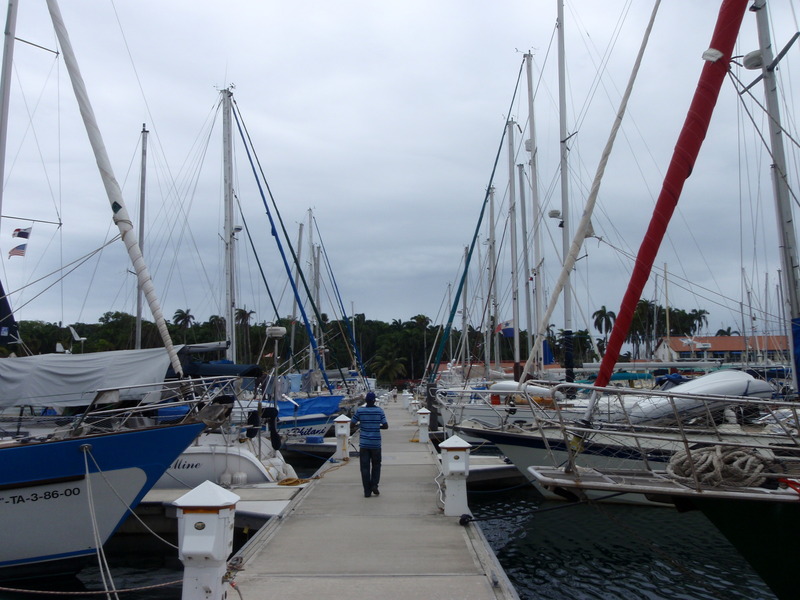 Our Marina, Kinda nice to see all sailboats and only one motorboat on our dock! This entry was posted on March 27, 2013 by Jacques. It was filed under Uncategorized .